In KV-1 Anti-Aging Beauty we have the solution to restore and repair your hair from the inside. 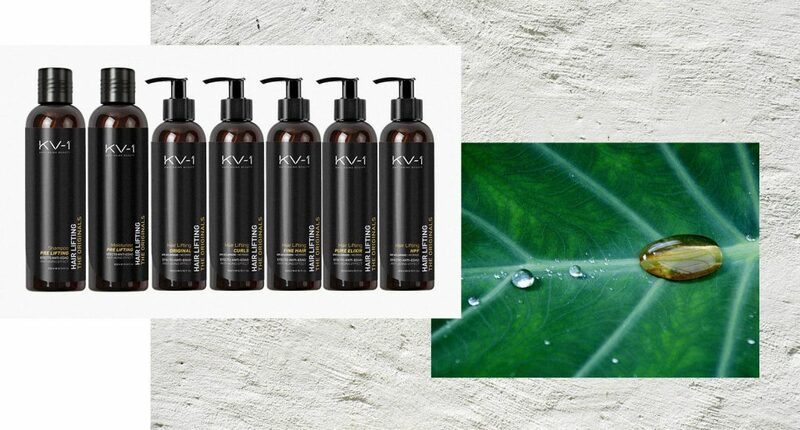 Intense repair treatment that deeply restores hydration and nutrition to the most damaged hair from the inside, besides protecting and prolonging the coloration. It provides sunscreens, 6 essential oils such as avocado oil, provitamin B5 and collagen that protect, moisturise and nourish the hair leaving it with greater combability, flexible and with an exceptional brightness. With a Hair Lifting for all hair types. It repairs the keratin structure of the hair with FORCE 2 giving it shine, softness extremes in addition to facilitating the combing. It has a concentration in active substances. It has a concentration 5 times its weight. Purity of components unprecedented in hair cosmetics. Contains Dimethiconol, a potent hair fiber repairer. Keeps the hairstyle for more time. It repairs the keratin structure of the hair, which gives shine, smoothness and combability. On the other hand, the truly outstanding features of this product are its densifying components with strength 1 innovative and unpublished in cosmetic sector of professional hairdressing. It does not need rinsing, which makes its effect much more durable. Contains citric notes to give more sensation of freshness in its application in addition to containing a purifying citrus extract. Contains sunscreen combined with the action of a colour-protecting agent. In addition to these properties, this facelift contains keratin that helps repair the keratin structure of the hair, giving it more shine, smoothness extremes in addition to facilitate combing. On the other hand, it is also a remarkable product due to its wearable nature, it does not need rinsing, which makes its effect much more durable and forms an extreme protective screen. It is an innovative formula that uses FixateTM superhold Polymer, a state-of-the-art component, instead of the traditional fixing polymers. It has the property of being able to direct the hair in the desired direction and maintain it in that position. It imparts, in addition, soft touch, extraordinary brightness and a renewed strength. It is removed without problems, with a simple wash without residues. It repairs the keratin structure of the hair, giving it shine, extreme smoothness in addition to facilitate combing. Apply SHAMPOO PRE LIFTING on wet hair and scalp. Massage gently and leave for 2 to 5 minutes. Rinse with plenty of water. In case of contact with eyes, rinse immediately with water. Apply a small quantity of the PRE LIFTING MOISTURIZER on wet hair. Massage and comb the hair with your fingers several times. Leave in on for 5 to 15 minutes and rinse with plenty of cold water. Apply the HAIR LIFTING corresponding to each type of hair, in the palm of the hand an amount equivalent to a hazelnut and distribute on wet hair with fingertips or with a comb. Focus on the tips. Comb as usual. Do not rinse.